Janathon looms, less than twenty-four hours away, and I've found the second week of training hard work. In theory Monday and Friday are rest days, but I rested on both Monday and Tuesday, leaving me with five consecutive days running for the rest of the week. So on Wednesday evening I started the week's running, with a trip out with the Seaford Striders along the winter route. I made a hash of starting and stopping the Garmin so, although I ran five-ish miles at a good pace, I have only a very partial record . Including the warm-up and cool-down, I think I can reasonably claim six miles. On Thursday I ran the first speed session of marathon training, a demanding two sets of fast 1.5 miles along Seaford front with recoveries and warm-up and cool-down. I enjoy speed sessions, though I never run as fast as I should: for this I ran the two 1.5 miles at paces of 9:22 and 10:07. The target pace for fast runs is supposed to be around 8-minute miles. Once more I failed to operate the Garmin correctly, not switching it off when I finished, so if you look at the Garmin connect figures, they may seem a little odd. Today, once more in the afternoon, as dusk approached, I went up to South Hill and Seaford Head. My legs were tired but I kept going over slightly sticky terrain. If Seaford Head were a racecourse, I would call the going soft to yielding. I shan't blether on about 2010. I didn't run as much as I wanted to, though I was cheered to cut my 10k time down a little. On to 2011, Janathon and the Brighton Marathon. It's good to have the first week of training under my belt. I finished off with seven miles along Seaford front, from home to Splash Point and then to the tip of Newhaven East Pier and back. The front was busy with the Seaford passeggiata, which in December takes place from 3 to 4 pm, and I had the great pleasure of meeting the Loske-Page family (that's the Sussex Loske-Pages, of course) and also Jane, the gifted cook at the sailing club, and her dog Daisy who is a little averse to runners. What, I wonder, might the five year old boy I was in 1960 have thought if he had been told that in fifty years time he would mark Christmas Eve and Christmas Day morning by going out in the cold, wearing shorts, and running? On Christmas Eve I went out for a evening run. My eyesight is not good enough to read the Garmin's screens at night, and if I lock the bezel, which is wise, then I can't turn the back-light on. Consequently a great deal of the run was spent stopping under lamp-posts, trying to make sense of the screen. I also failed to stop it properly when I arrived home, so it looks as if a three-mile run took me nearly an hour. This morning was much more pleasant: bright, if cold, sunshine, offering beautiful views from the top of Seaford Head. I ran a four mile route taking in South Hill Barn, Hope Gap and Seaford Head over surfaces likened by Sweder, ever ready with the running mot juste, to running on pavlova. When I was a very small boy, and my brother even smaller, we would sit in the nursery with our Swiss au pair Alice, watching dusk fall and the street lights come on, first red, then orange. It seemed to take an eternity. Then Alice would close the curtains, feed us and we would go to bed. So, after forswearing marathons after London in 2009, I find myself starting the sixteen week training for my eleventh, the Brighton marathon on 10 April 2011. It's good to be back in training, and even better to know that, now I work somewhere with showers, that training during the week is possible. I know that one of the reasons that London was so bloody in 2009 is that I trained mostly at weekends. So I set out from work to the canal. My instructions were to run a slow 2 miles, and I think I can say I achieved that. In fact, I paused to help a man who had fallen over on the ice by the side of the canal. I think there was no major damage done. As I helped him to his feet he told me that he had been, until quite recently a basketball player, but was now an old man who had to be helped up by strangers. I knew how he felt. Sometimes luck is in my side. After snowing for most of the day, at about 3 it stopped and the sun shone weakly in a pale blue sky. I set out for a quick three miles before dusk and choral evensong. The moon was already high in the sky and the snow and ice crunchy under my feet. I warmed up quickly. Few cars had tried to drive up the track to South Hill Barn, and I had the eastern side of the Head more or less to myself. Out to sea a dramatic sunset took place, a vortex of pink circles around a central heavenward shaft of light, the colours becoming more and more intense as the light faded. It could have come from the imagination of a Romantic who had overdone the laudanum. Once over the head itself, I took the descent carefully. Tobogganers threw themselves down the slope, careless of the fading light. They may still be there. The Garmin had run out of juice, but I know this run to be three miles. I was probably slower than usual. There was a record turn-out for yesterday's Mince PIe Ten Mile and, as you can see from Sussex Sport Photography's pictures, it was a perfect day. After spending an hour or so fouling up car-parking, I was marshalling at around the two mile point on the way out, nine miles on the way back, though I would have loved to have been running. 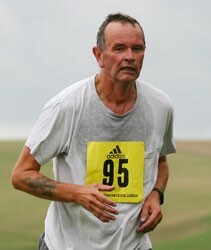 The winner was Robbie James of Lewes AC in a scorching 58:26. He was so fast I had barely got back from a cup of tea when he passed my point on the return journey. The first woman home was Katy Moore of Brighton and Hove in 1:07:31. There could hardly be a greater contrast in running environments than my weekday and weekend routes. On Tuesday I went out along the banks of the Regent's Canal, past derelict factories and workshops, past school playgrounds where children yelled and shouted, past a block of flats where a woman bellowed at someone, a child, a lover, or a husband, in impenetrable patois. In the cold there were few others around, a couple of runners, a dog-walker or two, and the hooded young men who frequent inner-city canal banks, passing sweet-scented cheroots to one another. I am afraid I can only claim two runs this week. And today, I took a sciatic trudge around Seaford Head. I had woken the previous morning barely able to move with lower back pain, though it became tolerable as I got up and started to move around. Today I felt a little better, though still conscious of stiffness, and I found I was slow. Nevertheless, even if I have a relapse tonight, it was worth it to breathe the cold air, and to see from the top of Seaford Head a dark edge of cloud out to sea, trimmed on the top with upward-rising fingers of cloud, pink as they caught the setting sun.